Carmel-by-the-Sea is a long-time favorite of mine. There’s something to be said for a town that actually prohibits street addresses — a law that was enacted by the founding fathers because they feared the village would become too citified if mail delivery was allowed. And to this day, the downtown area is still bereft of addresses, parking meters and street lights. I just love simplicity. Truth be told, it doesn’t take much encouragement for me to steal away to my favorite little seaside hamlet. 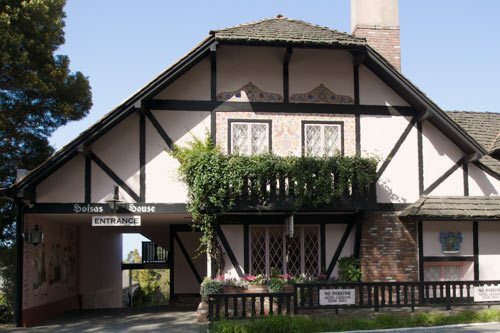 That’s why I was thrilled to hear that Hofsas House — one of my favorite local inns — is offering a special deal in celebration of their 70th anniversary this year. When you stay for three nights, you get 1/3 off the third night. How cool is that? And if you are concerned about access at Hofsas House, you needn’t be, as they have a nice accessible room with a roll-in shower. I was so jazzed about it when I first saw it, that I even included Hofsas House in Resting Easy in the US; Unique Lodging Options for Wheelers and Slow Walkers. Another great thing about Hofsas House is the attitude of the General Manager, Carrie Theis. She’s quite forthcoming about the access at her property, which is refreshing. Says Carrie, “If we can accommodate, we will; but I encourage people to call us and discuss their access needs, so we can provide them with the right room. I know every property in town, and if our place won’t work, I will suggest one that will.” You just can’t beat a honest manager! And while you’re in town, be sure and pick up a Wine Walk-by-the-Sea Passport for $65. It’s good for nine $10 flights at your choice of 14 different tasting rooms in the village. And if you want to share a passport with a friend, you can also do that. You can buy the passport at the Carmel Chamber of Commerce on San Carlos between 5th and 6th (see, I told you addresses were prohibited). The most accessible tasting rooms in the village are Scheid Vineyards, Wrath and De Tierra Vineyards. They all have level access, and either a lowered tasting bar or tables. And for a nice glimpse of the beach, drive out Ocean Avenue (which is pretty steep) to the end of the road. There’s accessible parking near a boardwalk that leads over to a deck with a great Pacific Ocean view. Be forewarned though, it gets crowded later in the day, so try visiting in the morning. It’s the perfect place to enjoy the sunrise. So go ahead, steal away to Carmel-by-the-Sea, enjoy some wine, take in the ocean view and save a few bucks. After all, you only live once! This entry was posted in Destinations, Lodging and tagged boardwalk, Carmel by the Sea, coast, Hofsas House, hotel, village, wine by Candy B. Harrington. Bookmark the permalink.